Ride the Machine: Poland's "M-14 Iskra" of 1962. 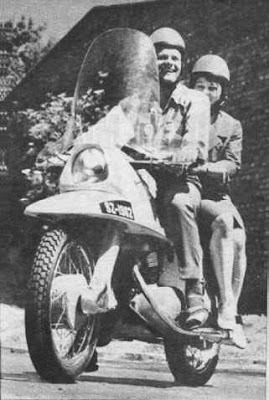 "Poland's Junak factory (a maker of single-cylinder bikes inspired to British realizations) realized a very interesting prototype: the "M-14 Iskra" of the 1962 with a totally new parallel-twin (350 cc, SOHC, 24 hp, 140 km/h), and with a very advanced fairing, realized in fiberglass and similar to the English Ariel "Leader" motorcycle. After this realization, the Junak brand disappeared definitively in the 1965. However, recently it's reappeared with a new cruiser model, the Junak "Millenium 250" twin (sixth pic)...but this bike is simply a Korean Hyosung, produced under Suzuki's license. There is nothing of Polish on this motorcycle." Retired emploees of the factory where the ISKRA prototype where developed are trying to construct a replica of that machine, basing on plan and documents that survived. One of them, Wojciech Kulesza, is a former contributor of the sport sucsesses of the other polish motorcycle - JUNAK, which production was stopped in the middle 60s due to the political directive of USSR, that decided about the polish industry these days. The motorcycle remains legendary for polish bikers. 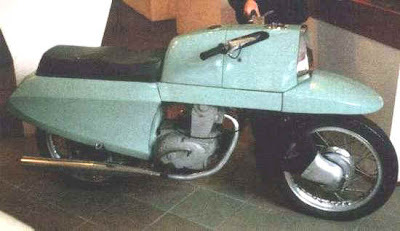 In the April of 1959, Junak set a top speed record for the polish motorcycle at 150 km/h. This record is still up to date, because there are no motocycles produced in Poland. Eng. Kulesza and the one who set the record - Franciszek Stachewicz, at 50th anniversary of that event, are planning to set the new record at 200 km/h, riding the actual replica developed and construced with the modern technology basing on the original plans. Unfortunately, the project is facing financial difficulties, however, let's hope that the next spring the objective will be accomplished. "ISKRA" means "SPARK" in Polish.